Victoria, B.C. 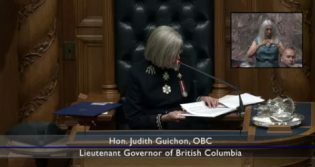 – Though much of it had already been leaked to the press, Lieutenant-Governor Judith Guichon opened the first session of the 41st parliament of B.C. with the speech from the throne this afternoon. A third referendum on electoral reform by October 2018. A ban on corporate, union, and third-party donations, including in-kind, to political parties. Strengthen lobbyist legislation and regulations. An immediate $1-billion investment over the next four years to create 60,000 new spaces. Cover an additional 150,000 children with full or partial child-care subsidies. Explore partnerships with school districts to co-locate new child-care spaces at elementary schools. A new poverty reduction plan with a focus on children. A $100 per month increase to social assistance rates, with a process to recommend future annual increases. Index annual disability allowance rate increase at CPI going forward. Basic income support for youth aged 18 to 24 transitioning out of care. Increase legal aid funding by 25 per cent. A commitment to fully implement Grand Chief Ed John’s recommendations in the Report on Indigenous Child Welfare. Work to fully eliminate MSP. 500 more residential care beds to support seniors. End the referendum requirements for new transit revenue sources. Raise the carbon tax by $5 per tonne per year, starting in 2019, up to a total of $50 per tonne by 2022. Eliminate tolls on the Port Mann Bridge, work with Translink to eliminate tolls on the Golden Ears Bridge and expedite the replacement of the Patullo Bridge. A Royal Commission on education – the first in 30 years and a review of the per-pupil funding formula to acknowledge the difficulties of declining enrolment. Consider moving the fixed election date from the spring to the fall. Fully fund adult basic education and ESL programs to help new British Columbians adapt and integrate. Double the Rural Economic Dividend to help diversify their economies. Work to open eight new mines by 2022, and invest $18 million to improve mine permitting, oversight, compliance and enforcement. Ensure food security and protection of agricultural land by doubling the Grow Local program and brining an additional 91,000 hectares of agricultural land into production by 2020. If this is what a minority gov’t result is with a strong opposition then I say let the liberals keep their role as the gov’t of BC and work with all parties to better BC for everyone. It would be truly wonderful if all these things came to pass. But. I see nothing about helicopters to transport injured to our hospital, or Angiograms done locally, in effect, no new healthcare for the Central Interior. And way too long a wait for surgery upgrades. I doubt you will see any changes in that from any party. There are changes coming to the hospital here. There have been new hospitals in Burns Lake and Ft. St. John. PG is not exactly the only community in the central and northern part of BC. Helicopters. Don’t hold your breath. There are only 4 BC Ambulance Helicopters in BC – 1 in Rupert; 1 in Kamloops, and two at Vancouver airport. We have no twin rotor copters here so they cannot even land at the hospital since the new national regulations cam into effect a year or so ago. That means handling a patient twice …. helicopter rescue on highway or in the bush, fly to PG since this is the highest level trauma centre in the northern half of the province … transfer to ambulance … then deliver to hospital …. triage and treat in PG or transfer to fixed wing ambulance to Kelowna or Vancouver airport … once more to ambulance and then to a choice of hospitals, likely VGH or St. Paul’s. Lots of these initiatives sound like they would have positive impact on the province. Strange that they could flip-flop so completely, but encouraging. I say let them try to govern with this new mandate, and the ‘threat’ hanging over their heads if they do not follow though for a combined NDP/Green vote to depose them. These promises in their campaign platform may have changed the course of the election. It was a tight race. I am a bit skeptical of course, but this party has governed for a long time and has at least an “acceptable” track record in many respects. They are more proven than a pirate coalition seizing power after the election. This new focus on improving social programs and education moves them up a notch in my mind. Why? They listened to the people. City Hall listened to the people with respect to the vus transit facility location. It is what smart government does when they hear what people have to say. I agree they should be given a chance. By “they” I mean all parties that have a say in allowing this to continue. When I first saw the BCLibs policy handbook a decade or so ago, I could not believe my eyes because many of the initiatives put forth and approved by the party members sounded more left of centre than right of centre. This is what we all wanted. Now if the other parties can allow their MLA’s the right to support these policies rather than being focused on seizing power in their name then this will have been a very good election result. After they are defeated and the NDP’s Horgan forms a government, I wonder if the Liberals will support these same policies when the NDP introduces them in legislation. Is their conversion genuine or opportunistic, that is the question? Do we want to find that out? The thing that gets me is that people in this province as well as in other parts of Canada and the USA are still fighting rather compromising. Not very effective and efficient. Emotionally as well as financially very costly. What does Bob Simpson say? He has some very sane views of the AAC in the Quesnel TSA as an example of his quality of thinking as well as knowledge..
NOW when the NDP/GREENS proposed this there was nothing but whining and sniveling. Maybe we should let the Liberals try this out and if they renege on any of their promises we can kick their azz out the door.IF it wasnt for the threat of a minority govt. i highly doubt anything would materialize. This could be good for the people of BC. IN response to Ammonra i feel this is 100% opportunistic. Elections are very expensive. Time for Christy to take a walk in the park and reflect on her future. Its a pretty sad state of affairs when she puts forward suggested legislation that her and her Government have been avoiding for years. She must think we are all fools. The problem with Christy is that she does not have the full support of her party, and there are those who will be calling for a leadership review very soon,. If they have a review then she stands a good chance of losing. If she forces an election sooner rather than later, and makes it appear that he election was caused by the NDP/Greens, then she can try and win a majority. If the NDP/Greens stay in power for a year or more, then there is good chance that the Liberals will change leaders going into another election. So now we can sit back and watch the song and dance show of Christy Clark. Those not happy with her are not those to the left of centre. They are the old social creditors who are to the right of centre. She was voted in by the left of centre. The party has been a centrist party since then. I think that this election has shown that going back to the right of centre will kill the party for some time. And that is exactly what we know people like Palopu actually want.